In a large pot, sauté 1 bunch of chopped scallions, 1 tbsp minced fresh ginger, and 3-4 cloves chopped garlic in 1 tbsp sesame oil for about 1 minute. Add to that about 3/4 lb shiitake mushrooms, de-stemmed and sliced. (You can also use dried shiitakes instead of fresh but make sure to soak them according to the package directions first). Cook for 3-4 minutes over medium-high heat and then add 4 cups unsalted vegetable stock and 3 cups water and about 2 1/2 tbsp white miso. Next add about 4 bunches of chopped baby bok choy, and about 6 strips of kombu (kombu is a type of kelp; you can find it at most Asian-run grocery stores near the dried seaweed). Finally, add some bonito flakes or 1-2 tbsp furikake rice seasoning with 2 tsp fish sauce (these are rough guidelines, but do it according to your taste). Simmer for about half an hour, and then remove the kombu strips and throw them away (they’re only for flavoring). Add a 14 oz block of firm tofu, cubed, and I also added a spoonful of sambal oelek red chili paste for a little heat. Serve with nori strips for a little extra delicious flavor, and a dash of sriracha or soy sauce if you like. 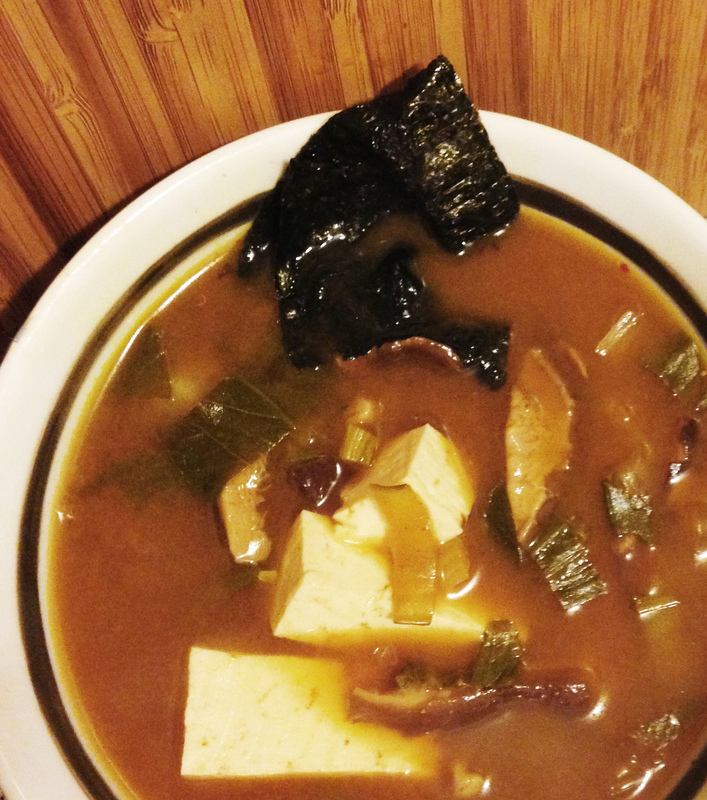 This entry was posted in Cooking adventures and tagged asian, mushrooms, shiitake, soup, tofu, vegetarian. Bookmark the permalink.